We have, through the development of ETP-OCTOPUS, explored the many positive qualities of our hydraulic hub-shaft connections. The most important features are compact design, quick locking, accurate positioning and good runout. The joint will not damage the contact surfaces and must be easy to dismantle. For ETP-OCTOPUS the pressure setting is done with an external pressure source separate from the clamping joint. This makes the pressure setting extremely fast and makes it possible to pressurize several joints simultaneously and remotely. 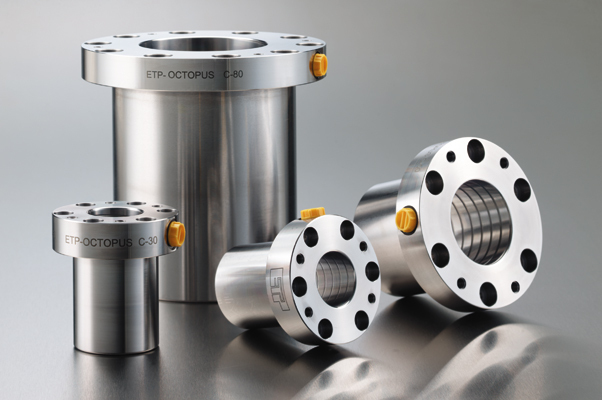 ETP-OCTOPUS is a double-walled hardened steel sleeve with a flange. In the flange there are bores for mounting of a hub and a scraper with a screw joint, threaded connection for hydraulic oil and an air relief screw. The inner diameter has spiral tracks in order to get an even friction and a defined locking force. The assembly is done with the screw joint. 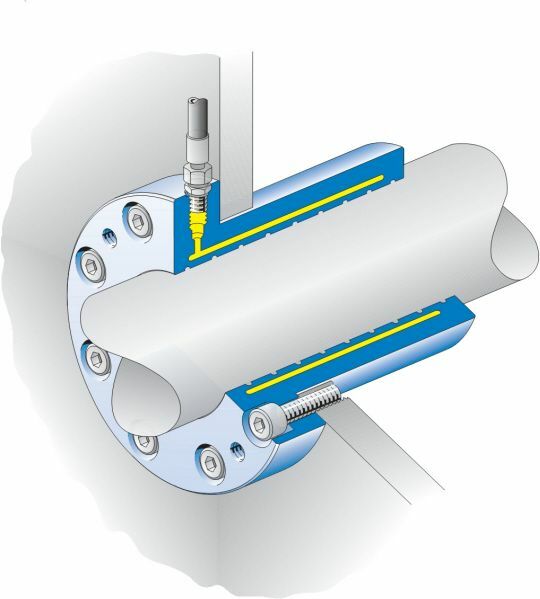 When hydraulically pressurized the inner sleeve expands uniformly against the shaft and creates a rigid joint. When the pressure is released the sleeve returns to its original dimension and can easily be moved along the shaft to its new position and be repressurized. Both axial force and torque can be transmitted. Easy to build in, only space for the screw joint is needed. Can be used independent of the operating temperature. No axial movement during pressurizing.